I've been into leather pieces (whether they are real or they just resemble one) since college, and I somehow find myself having skirts, shorts and leggings made from this material. 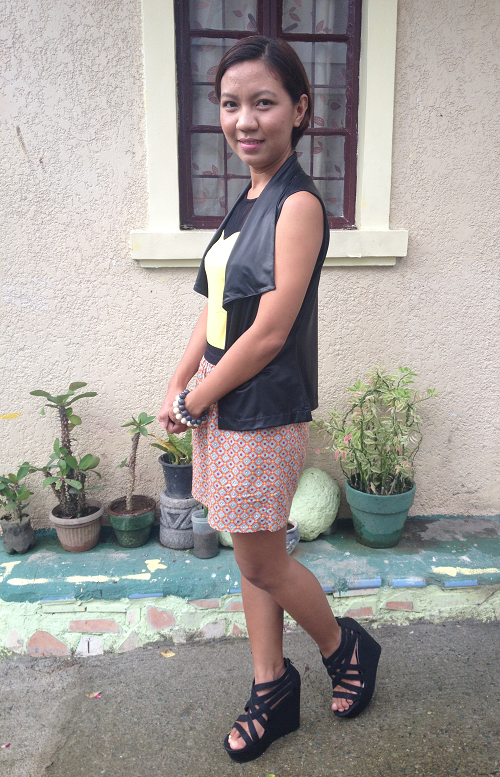 But I think the most used "leather" clothing I have is this vest from Betty. I purchased this two years ago and it is always my go-to coverup whenever I wear a tube dress or something that I want to wear in the office. The outfit that I'm sharing for today would have been a simple top and skirt combo, but I decided to wear vest along with this yellow top and printed skirt because of the fact that both items have black details on them (garterized belt for the skirt and black mesh for the top). And somehow, this vest made the outfit a little "edgy". Something that I would have worn in a Rock concert (too bad this is not my outfit for the Linkin Park concert). I still can't go all out on edgy look, so I just used these bracelets from Keos and my black wedges from Payless. What do you think? By the way, I was on a double shift last Tuesday due to a deadline at work, but I still had fun at the Linkin Park concert that night. The band was really amazing! I really am into artists that perform live and still sound as good as their recorded songs (even better if they surpass them), and all the members are so talented. I only have mostly videos of the said event, but I'll see if I can share some photos with you in one of my future posts. Anyway, today is payday so hope everyone is in a good mood. Happy Thursday to all! thanks Jenniya!this vest is already overused haha!